LSU athletics director Joe Alleva was interviewed on "Off the Bench" on 104.5 ESPN Tuesday morning and was asked to give his evaluation of the 2018 season, which exceeded many preseason predictions. 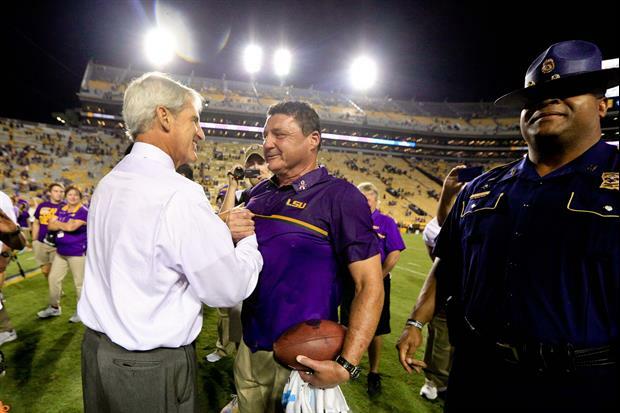 "It was a great year for LSU football, considering what all the experts expected," Alleva said. "Whenever you exceed expectation, that's a good thing. But there's a lot of things that go into evaluating the program. Things like recruiting, how kids are doing in school... there are all sorts of things that go into evaluating the football program, and I think that coach Orgeron and his staff have done a terrific job." "And they continue to do that out on the recruiting trail, motivating the players, and reaching out to the fans and doing all sorts of good community service. So, I think the program's in good hands and is heading in the right direction." Alleva was also asked whether or not he has spoken with Orgeron about a contract extension. "Not yet, but I think we'll probably have some conversations down the road, but we hadn't had any yet. The season's still not over yet." Orgeron's current contract pays him $3.5 million per year and will expire on Dec. 31, 2021. Losing to a really subpar UF was terrible. Not a great season. Just a minimal season. aTm (assTomouth) was decided by the refs. You people are teenage menstruating idiots. He was asked about giving CEO an extension. He said they haven't talked about it, they probably will LATER, but we at least have to play the bowl before we start talking about any of that. He gave the correct answer, and you're all losing your effing minds because we beat ATM three times but got screwed by the zebras, which is out of O's control? Fault these people for something worth faulting them over. Let's go beat UCF. Pansies. Direct your anger at what you're actually mad about. He beat one team of significance and that is Georgia. Hard to imagine LSWHO/CORNDOGS paying this guy over 3 million a year. And he is supposed to be a D-LINE expert. His D-LINE is a sad bunch of has beens. Fire Alleva now. That is all. Do you remember what the expectations were? We definitely exceeded expectations and its not close. This thread shows how absolutely stupid our fan base is in so many ways. Congrats in all your minimum wage paying jobs! Helps the rest of that actually have some intelligence get ahead in life. I used to hate stupid people. Now I love them! What do you guys expect him to say. He went all in and hired Ed O!! I would wait until after next year or if I need to extend to avoid negative recruiting (to make sure a recruit knows his coach has a 4 year contract like he has 4 years in school) then I would add 1 year, but don't go nuts on the buyout. I would give him a slight raise to $4M on the 4th year. That would eliminate any further negative recruiting that they only extended O for One year, where they can claim a raise was given. You expect him to say that we exceeded expectations by two wins over what the high majority thought. We were robbed at aTm or we are sitting here looking at a possible 11 win season. Congrats to Coach O an incredible year. How was it a great year? We still lost 3 games as usual and worst of all, we lost to a&m.. There is no such thing as a great year when we lose to a&m as well as two other schools. Also, in retrospect the schedule was not any where near as hard as thought to be. Auburn and Miami were atrocious. Glad to win those, but the only game we won that we maybe shouldn't have expected would be Georgia.. but the losses more than counter that IMO. Florida and a&m and then not even being competitive against Alabama. We have not moved forward as a program. And now we can't even beat Mullen on the regular and we have Jimbo to deal with. So Alleva's version of a "great year" is a second tier bowl game? Good to know. His road is ending at the end of bowl season. It is his wording. Dude said “not yet and maybe somewhere down the fricking road” and we have a total mf meltdown on the board... MF’s are pathetic!! Am I saying Alleva should extend? Absolutely not but who knows what the hell “down the road means?” Down the road could be he wants to see more next year and the year after next before he extends who knows!?!? I think MF’s have too much time on their hands and should find a dam hobby. Some LSU Fans can be a joke!! 2021. Leave it at that. No need to extend any thing. A bonus for a bowl.. sure. It was a good year and quoting that was sarcastic. Most fun I have had in a season since 2011. I very much enjoyed this team.